For over 25 years we have captured the artistry and allure of fireplaces. Our outstanding quality of product, style, service and knowledgeable staff has put us above the rest! We invite you to browse through our large selection of fireplaces that will embrace any style and any budget. To complete your fireplace project, Scotts Fireplace provides a complete range of services apart from merely installing your fireplace. We give the entire wall the attention required, not just the fire focal point, from framing and dry-walling to finishing it with a cast stone mantel or our Ledge stone products to complete the look. We are your complete solution. We invite you to come see our stunning showroom that showcases our custom projects that will inspire and prove our technical and artistic qualification to take on your fire focal point. See how the element of fire can transform the ambiance of your indoor or outdoor living space. Established in 1984, Forest Glade Fireplaces specializes in providing Gas Fireplaces of outstanding quality to both residential and commercial clients in the Windsor, Leamington and Essex County. Known for offering Many Styles….One Objective….and a Dynamic Performance in everything we do, we are a full-service fireplace, stove & BBQ dealer. Our team consists of knowledgeable and licensed installers, capable of offering endless installation possibilities! Since 1999, Forest Glade Fireplaces has been conveniently situated at the corner of Banwell & Tecumseh, in Windsor Ontario. Our 2500 sq. ft showroom features everything from fireplaces to wood stoves, BBQ’s, furnaces and air conditioners. 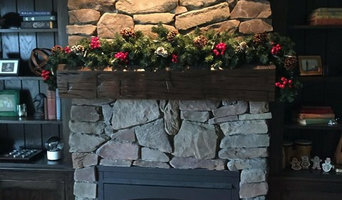 Come and view our wide selection of options, including the unique mantels and materials offered to customize the fireplace you envision. In fact, we invite you to come see the 30 units currently burning in the showroom! It’s very important to Forest Glade Fireplaces that our clients’ purchasing experience is flawless and trouble-free. In an effort to make shopping more accessible for our clients, offering a second location in Leamington; geographic expansion is just one way in which we continuously strive to improve customer service. Brighton Stone & Fireplace, Inc.
*Authorized Kozy Heat Fireplace Dealer* We are a full service hearth store offering our customers the best products in wood, gas, pellet and electric located in Almont, MI. Owners, Mike and Marilyn, started Creekside over 10 years ago as a result of their own struggle with high heating costs. We know personally what it is like to have high heating bills and not be comfortably warm. This is why we are constantly looking for ways to save our customers money and keep them warm at the same time. Our goal at Creekside is to help our customers create lifelong memories by safely gathering their families around a flame, any season of the year. We achieve that by offering quality products, customer service and honesty to our present and future customers. Even in today's market, no product is better than the service behind it. This is why from the very beginning Creekside has been committed to servicing the products we sell. Our trained staff is here to assist you before, during, and after the sale. Atlas Cut Stone, Inc. has been supplying limestone the metro Detroit area for 80 years. Fabricating & Manufacturing stone products, custom cut limestone and related products. Working directly with architects, builders, contractors, landscapers and homeowners, Atlas Cut Stone fabricates custom-cut and hand-carved limestone designs including balustrades, architectural accents, interior/exterior fireplaces, columns and capitals, profiled coping, signage, chimney reducers, window/door sills, and window/door surrounds for residential or commercial properties. Whether your application is a home renovation project, a new stately manor or an office complex, we have a collection of stone that will satisfy even the most discriminating buyer. *Authorized Mendota Hearth Dealer* FireClass has been installing and servicing factory built fireplaces for over ten years. Carrying the banner for Lennox Hearth Products, we are a four time Presidents Club member, their most prestigious award, given to their top 20 distributors nationwide. At FireClass, installing your factory built fireplace is just the beginning. We not only service what we sell, we will service all makes and models of fireplaces. We provide and install wood mantels and marble, granite and slate surrounds, too! 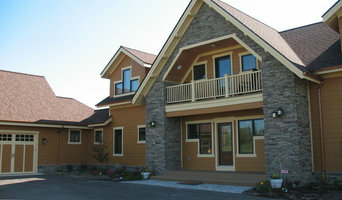 As Owens Corning Preferred Installers, Cultured Stone® is yet another of our specialties. We pride ourselves on exceptional work, completed on time, at a competitive price. If a masonry fireplace is your preference, we can even deliver them! We are proud to install modular masonry fireplaces by Isokern. These are a factory built product, made from pumice mined in the Arctic Circle in Iceland, that provide exceptional heat deflecting properties. We can assemble one of these on a combustible floor, with air cooled metal chimney; at a fraction of the cost of the old style all brick chimney. After finishing it off with real firebrick, you have a masonry fireplace that performs much better than a site built fireplace, has a Warnock-Hersey testing, and is installed in hours, not days. Premium Fireplace, and chimney sales and service. *Authorized Lopi & Fireplace Xtrordinair Dealer* Allstate Home Leisure is a premier Jacuzzi spas, Sundance hot tubs, Dealer serving Greater Detroit including 5 Stores - Ann Arbor, Livonia, Novi, Sterling Heights, Rochester MI. We sell and service hot Tubs, spas, above ground pools, portable spas, outdoor patio furniture, fireplaces, gas and wood stoves, BBQ grills, billiards, pool tables, game room products and much more! In 1992, Gary Jordan decided to make a risky career move. He left his job at GM and opened a Darts and Billiards store in Redford, Michigan. And Allstate Home Leisure was born. The business quickly became known for its wide selection of quality products and family friendliness. Good old fashioned word of mouth rapidly spread our good name enabling us to create many loyal customers and friends. After all these years we are still a family business, with Gary’s son-in-law Roy Farmer now CEO. Friendliness is still a key to our success. We have added more quality products over the years including Patio Furniture, Hot Tubs, Fireplaces, Pools and BBQ’s. There comes a time in your life when you deserve some luxury. Provide do-it-yourself installation advice and user-friendly chimney products to homeowners. DIY videos on how to install Chimney liners, chimney caps, chimney covers, fireplaces, wood stoves, and more. Free shipping to lower 48 states and Canada. Do it yourself and save! Fireplace and outdoor living located at 2025 Taylor Rd by Great Lakes Crossing in Auburn Hills MI. 5 Star Designs fabricates decorative concrete countertops, vanities and fireplace surrounds. Custom orders also available. What should you know about buying a fireplace in Detroit? Since wood smoke contributes to air pollution, many cities have banned the use of wood-burning units. If you’d like to buy a wood burning unit, check the Detroit, MI city policies first. If your home already has a wood-burning unit that you’re concerned about, contact a fireplace manufacturer to replace your wood-burning unit with an environmentally friendly electric or gas alternative. Gas inserts can be efficient heaters and may lower your electric-heat bill. Many adjust to provide high heat on a cold night or a low-burning flame for ambience. Interior fireplaces and mantel designs are as varied as home interiors. From custom fireplace mantels made to conceal a flat-screen TV to custom hearth designs with elaborate Renaissance-style stone mantels, the latest designs can be found by visiting Detroit, MI fireplace showrooms. Find fireplace manufacturers and showrooms, plus fireplace installation professionals, on Houzz. 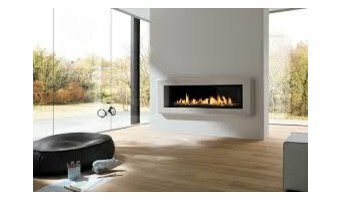 Go to the Professionals section to find Detroit, MI fireplace design and installation experts.